Home / Everything Related to Hockey / Who Will Win the 2019 Stanley Cup? The 2018-19 National Hockey League (NHL) season is the 102nd season in the league’s history. With the regular season running from October to April and the Stanley Cup playoffs beginning shortly afterwards, there is still plenty left to play for among most of the 31 franchises. So, at this midpoint stage of the season, who’s looking to be the favorites to claim the Stanley Cup? The Tampa Bay Lightning team, who claimed their only Stanley Cup in 2004, are the current favorites with the bookies, having enjoyed an electric start to the season. Thanks to the goalscoring efforts of Nikita Kucherov, Steven Stamkos and Brayden Point, they currently top the Atlantic Division from the Toronto Maple Leafs and look well placed to secure a second divisional title in two years. The Winnipeg Jets and the Nashville Predators, boosted by the goaltending heroics of Pekka Rinne, are neck and neck at the top of the Central Division, and both will be hoping to claim their maiden Stanley Cup in the summer. New York Islands and Calgary Flames lead the other two divisions at this stage, with Washington Capitals and San Jose Sharks in hot pursuit. Eight of the teams from each of the two conferences may qualify for the playoffs, based on their overall points totals. This means that there’s plenty to play for, even for those franchises who haven’t quite got off to the best start. The Boston Bruins and Pittsburgh Penguins, with 11 Stanley Cups between them, are in the mix for the two Eastern Conference Wild Card slots, while the Dallas Stars and Colorado Avalanche, (spearheaded by Mikko Rantanen), look set to claim the two Western Conference slots at this stage in the proceedings. 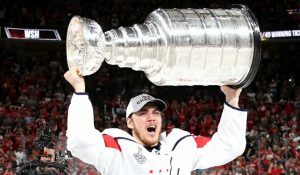 However, as all hockey fans know, there’s still a long way to go, and it remains anyone’s guess as to who will be lifting the trophy come June.